Location: At the end of Millstätter See, Austria. 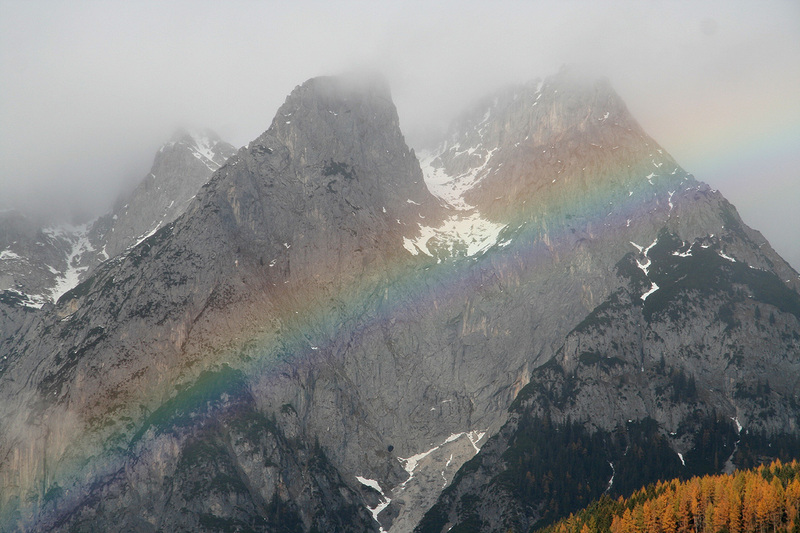 How to get there: This mountain is located near the south-east end of the Millstätter See in Austria. 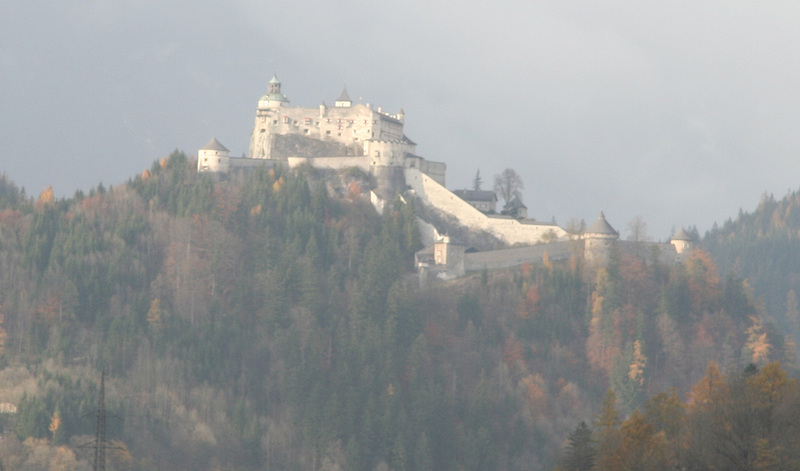 Coming from Salzburg, take A-10 south and drive through the two long tunnels (toll, Euro 9.50 as of 2007). As you approach Spittal, look for the exit that will take you to Hwy. 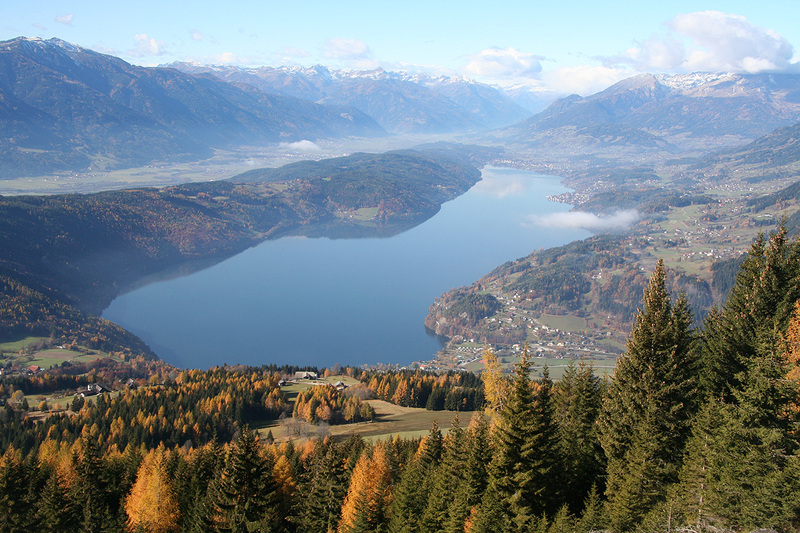 98, or Seeboden and Millstatt. As you enter Seeboden, you shall go straight in a traffic circle, measure from this point. At kilometer 0.5, there is a second traffic circle, go straight. Continue along the scenic Hwy. 98 with the lake Millstätter See on your right side. At the far end, drive around the village of Döbriach, by making a very sharp right turn at kilometer 14.3. At kilometer 16.8, go straight. A right turn at this location will bring you into the village of Döbriach. If you need a place to stay for the night and feel like deserving a bit of luxury, I can recommend the hotel Seefischer located here. At kilometer 18.9, you enter the small place Glanz. Drive through this place and start looking for a very sharp left turn at kilometer 19.6. Drive up this road and go right at the next fork at kilometer 20.3. The road now climbs the hillside, keep left at kilometer 22.2. Then, at kilometer 23.3, stay left again. 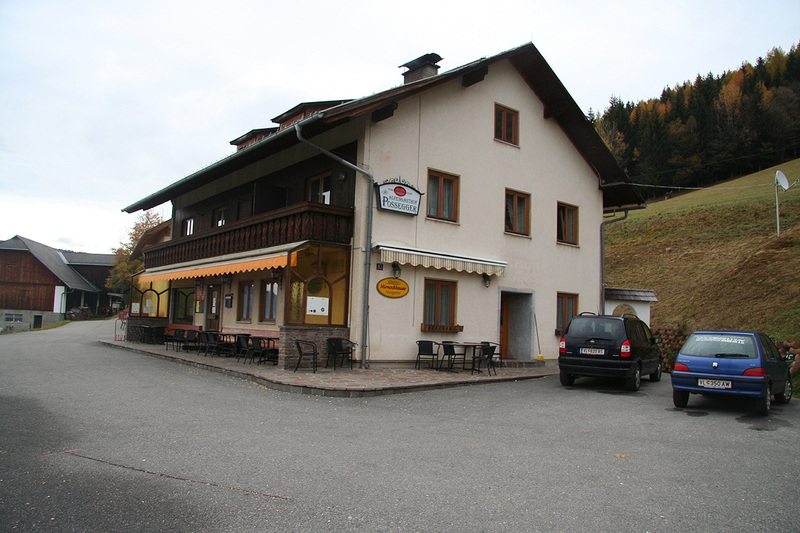 You pass through another farm, then arrive at the Possegger Alpen gasthof at kilometer 24.1. This is a good trailhead, park here. The location is N46:45.815, E013:40.467 and the elevation is 1222 meter. Route description: Walk by the two buildings towards the barn, then proceed directly uphill. There is a bench after only 50 meter, hopefully you do not need a rest already at this point. The trail runs up through the forest, it crosses a forest road at several points. Pay attention to the trail markers whenever you cross this road, otherwise the path is pretty obvious. 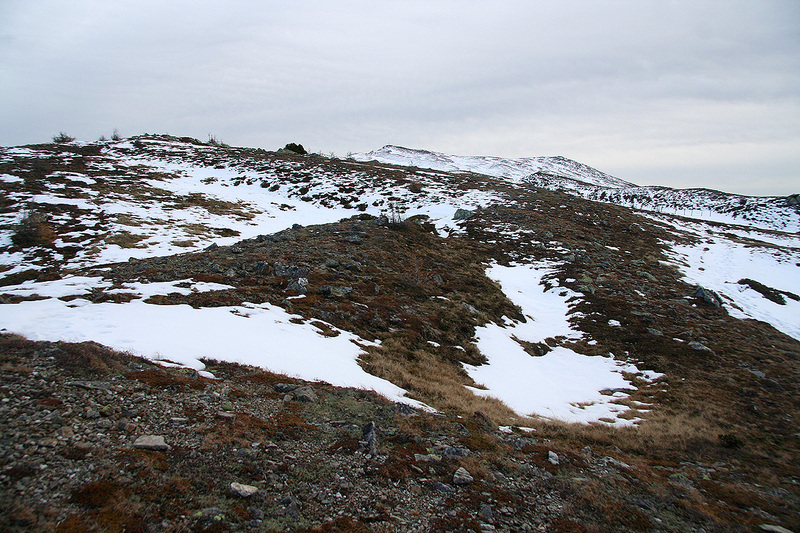 After a while, the trail reaches a ridge, here the direction turns more left and continues to climb until reaching open grassland. 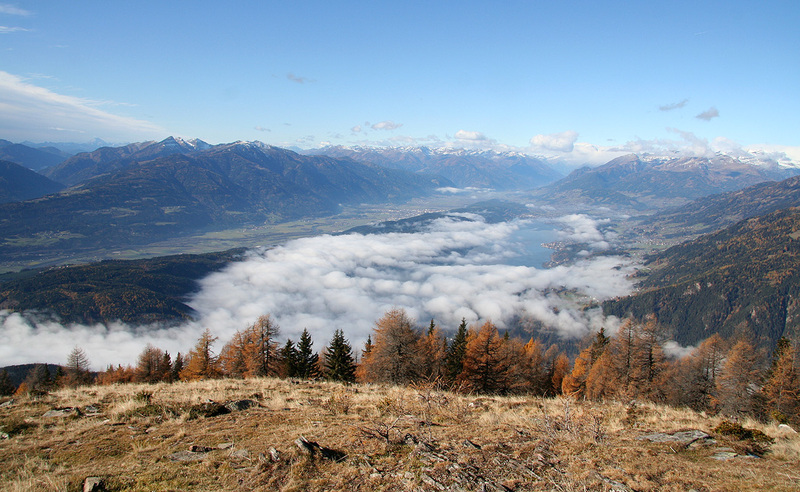 A local viewpoint at around 1850 meter, is located at N46:46.008, E013:41.465, from here the views of the valley and the large lake (Millstätter See) below is already outstanding. 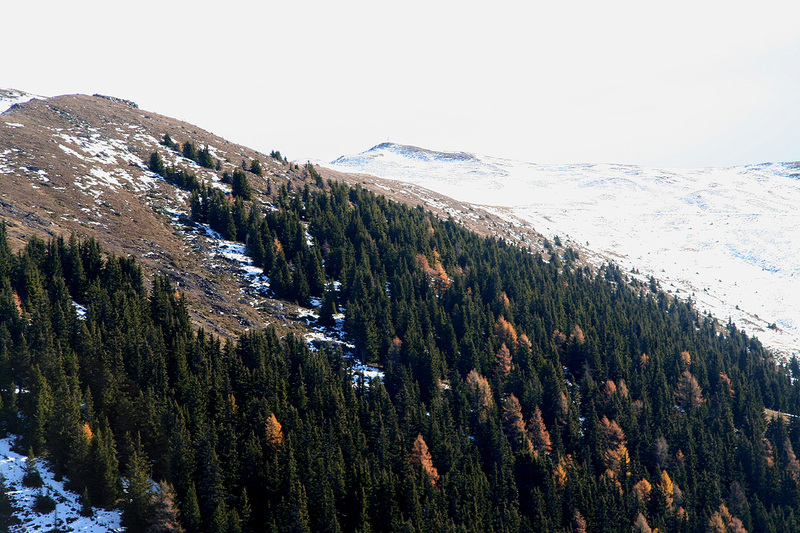 From here, the trail traverses right, before making its final ascent to the mountain plateau. The summit can be seen further onwards, the mountain landscape looks similar to what you can find many places in Norway. Cross a fence, then enter the top of a fairly horizontal moraine ridge that leads to the final short slope to the summit. Comments: Driving north after my afternoon climb of Hochobir, I ended up in the small village of Döbriach. The future looked bleak as I only located a hotel that had a "closed in November" sign posted on its main door. Searching further, I came across a quite fancy 4-star hotel with a full parking lot. At least this was open, however, the reception initially came with more bad news: "We are full, no rooms available." Fortunately, upon looking more carefully, they located a very fancy room that was available. This place had swimmingpool and sauna, as I did not bring any swimwear and as there was little time left before dinner, I was more than happy with a warm shower in my room. The dinner turned out to be rather fancy as well, a six course event with excellent service and excellent food. The next morning, the weather looked pretty miserable. However, the friendly hotel owner told me that this was only local fog, as I was checking out. As I drove up to the trailhead, his prediction proved true. I was soon above the fog, but the sky had a high cloud cover, fortunately high enough to stay above the mountains. I left my car at 0900 and reached the summit shortly before 1030. As this climb was totally unplanned, I had no idea what this mountain looked like. To maximize my chances for success, I carried my ice axe along, just in case the summit area might be steep and have snow or ice. 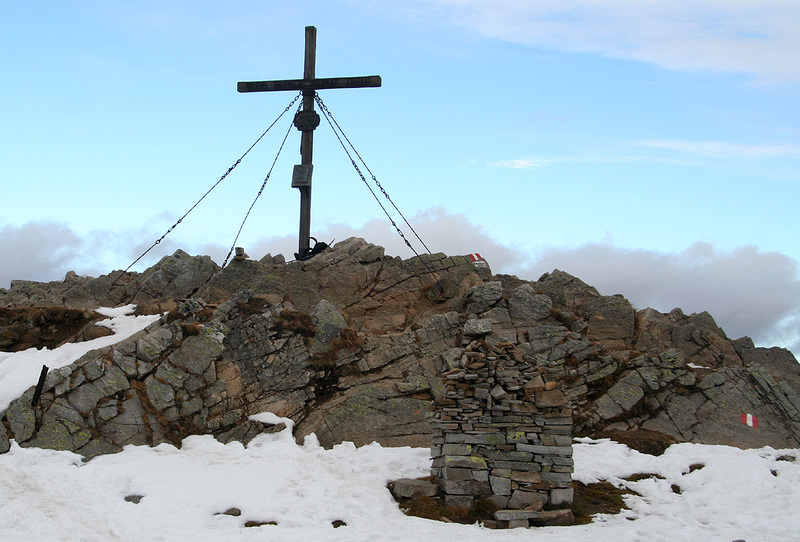 However, as I came up to the 2000 meter level, I realized that Mirnock was very atypical for Austrian mountains, in fact it could very well have been located in Norway. A fairly good sized mountain plateau stretched out before me with a "small hump" slightly higher than the rest, forming the actual summit area. Definitely no need for an ice axe here! It was a bit windy and cold, for the first time this weekend, I had to put on my jacket. 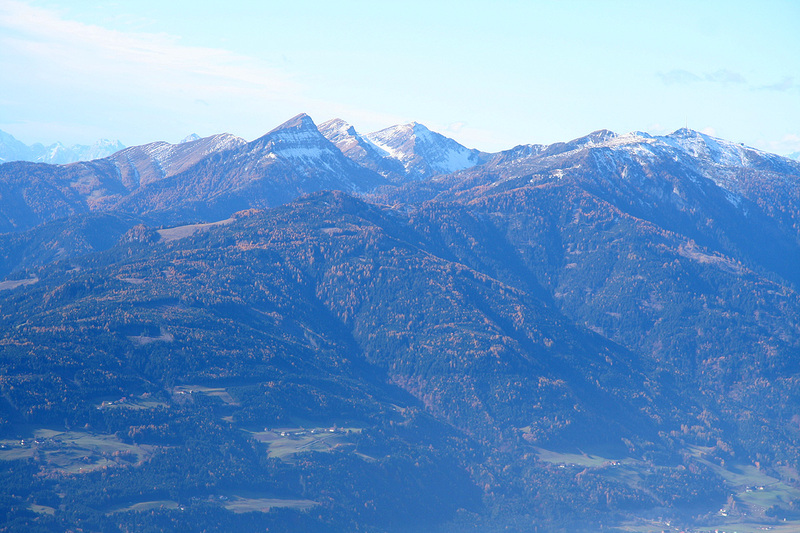 I started descending at 1045 and hiked down to the nice viewpoint at about 1850 meter. The sun broke through and a pretty large patch of blue sky appeared overhead. I declared a new rest, sat down and enjoyed the warmth from the sun. The view was nice, three summits across, more clouds scattered among the distant peaks. The fog that had covered the valley completely in the morning, gradually disappeared as well. 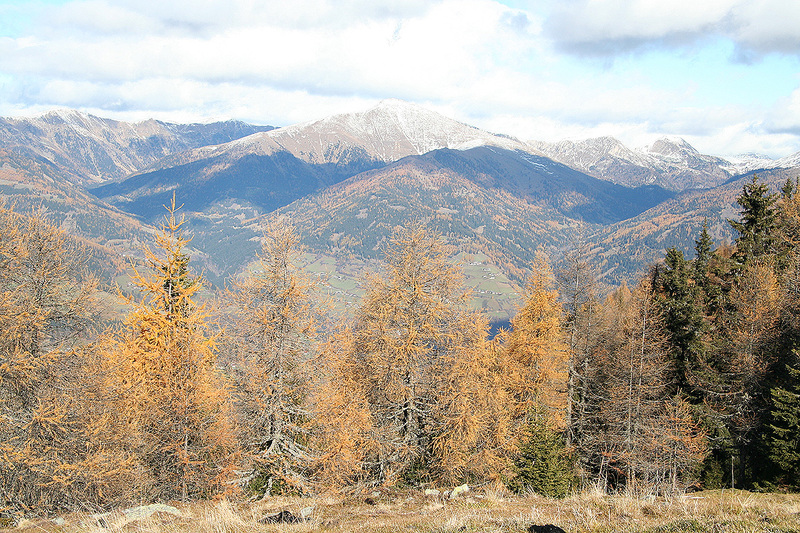 The nearby valleys with different shades of color, the fall has certainly arrived. I reached my car at 1200 noon and knew I had been lucky with my target hiking area. Further north, there was rain and snow had been forecasted above 1000 meter. I drove back to Linz via Salzburg, with a short detour to explore a possible trailhead for Raucheck. Nearby, one cannot avoid to admire the Werfen Castle known from the movie "Where Eagles Dare" (Alistar McLean / Clint Eastwood). 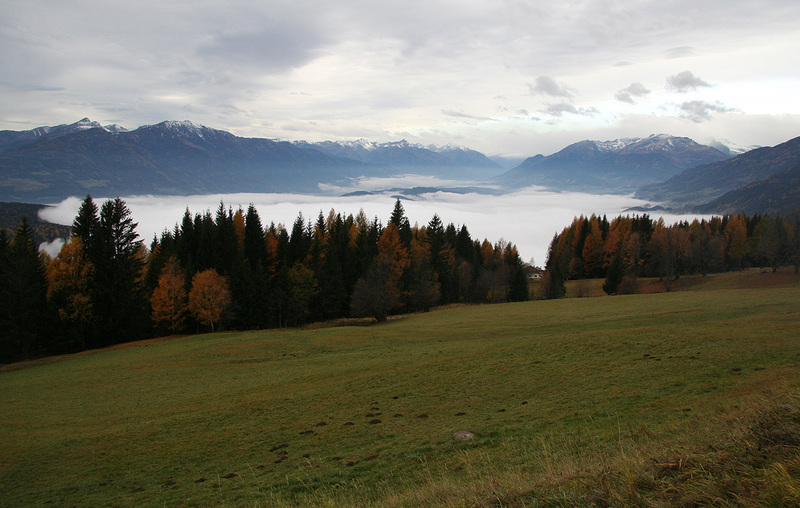 The Millstätter See, covered by fog in the morning. The Millstätter See, as seen when descending.